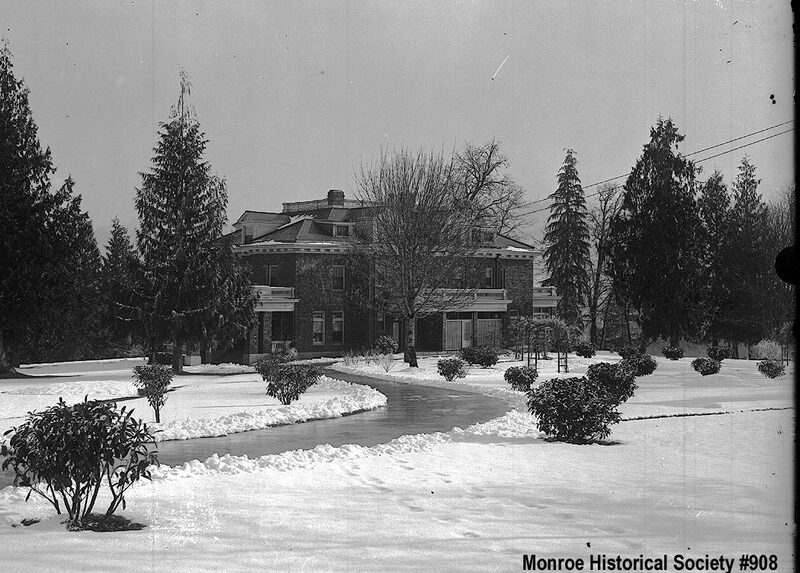 Started in 1864 by Henry McClurg as the settlement of Park Place, Monroe experienced rapid growth in the early 1900s due to its rich farmlands and abundant timber, and its proximity to the Great Northern Railroad. 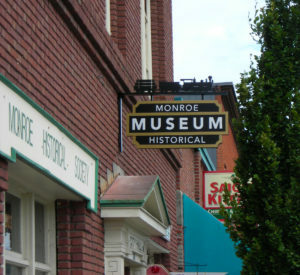 Monroe is scenically set against the foothills of the Cascade Range, near where the Snoqualmie and Skykomish Rivers join to form the Snohomish. Vanished Landmarks – March Program and Membership Meeting This year’s annual event will be held on Saturday, March 23 from 1:00 to 3:00 pm at the Monroe Public Library. 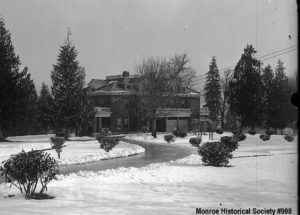 A brief review of the Society’s progress in 2018 and election of officers and board members will be followed by a special program focussing on landmarks of Monroe that have fallen victim to time. This will include a slideshow and commentary on sites such as the Reformatory Superintendent mansion, pictured here, which was demolished in the mid-1960s. The program is free and open to all. Come and learn a bit of local history and mingle with friends. 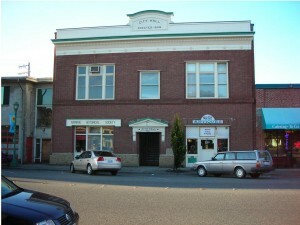 The library is located at 1070 Village Way. Hope to see you there! 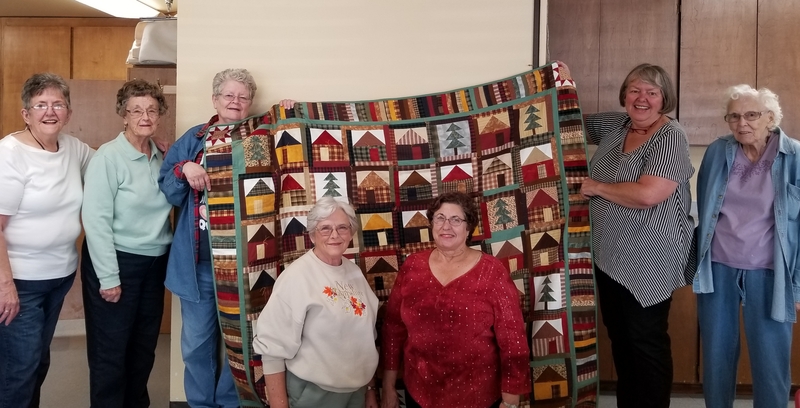 2019 Quilt Raffle The Monroe Historical Society’s annual quilt raffle is back this year, thanks to a beautiful queen size quilt, Houses and Trees, crafted and donated by the local Queen Bee Quilting Group, pictured here with their finished masterpiece. Tickets, available at the museum, are still only one dollar and include a coupon for Ben Franklin Crafts and Frames. All proceeds go to help keep the museum open. From left to right, Janet Osborn, Mildred Ness, Sandra Freeman, Sharon Parker, Marilyn Karlsson, Pat Powell and Delores Hanson. Historic 1910 plat map now available online A high quality image of the 1910 Snohomish County plat map is now available online through the League of Snohomish County Historic Organizations (LOSCHO) website. Red arrows on the map correspond to available historic images. Zoom to the Monroe area near the bottom of the county, left of center. Images of other historic maps will soon also be available for viewing. Congratulations to our 2018 Haji Family Scholarship recipient, Kevin Milne. The Monroe Historical Society is proud to offer this annual scholarship to a graduating Monroe High School senior each year, thanks to a generous endowment from 1941 Monroe High School valedictorian Hiroko Haji. 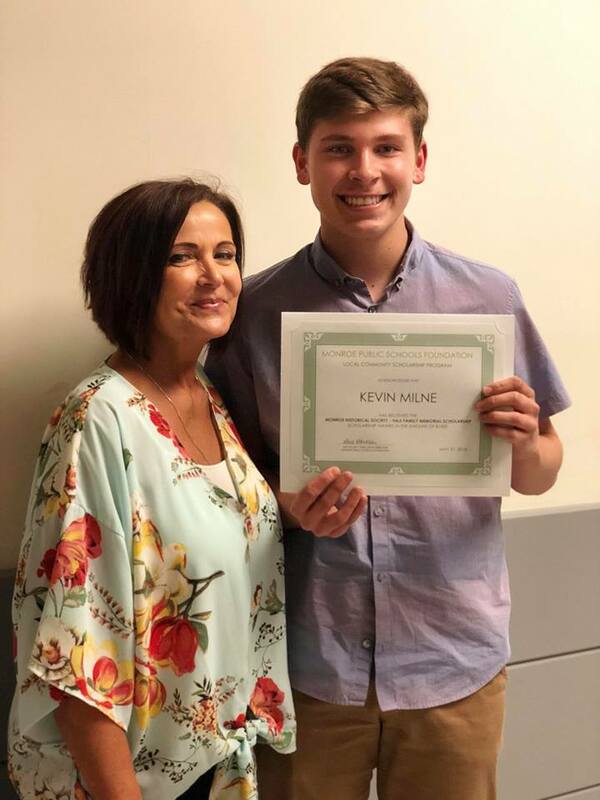 Society trustee and longtime Monroe Public School teacher, Dottie Simoni, on left, presented this year’s award to Kevin on May 31st at the high school’s award ceremony. It’s a sign! After many years of watching our old museum sign deteriorate and hoping a new one would take its place we finally have a wonderful new sign gracing Old City Hall. The mounting bracket is topped by a metal cutout showing a steam locomotive and a load of logs. This attractive addition is thanks to a generous grant from the city of Monroe and the work of Pablo Guerrero of Amigo Arts in Monroe. Come by and take a closer look, and a big ‘thank you’ to all who made it possible. The city has promised to at least trim back the trees this fall which, as much as we like foliage, have begun to make building fronts hard to see. 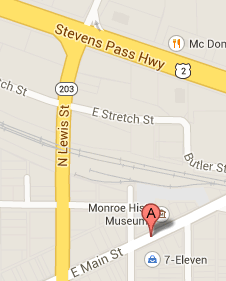 Now you can donate to Monroe Historical Society simply by shopping! Fred Meyer stores donate a portion of the money you spend to a non-profit of your choice. 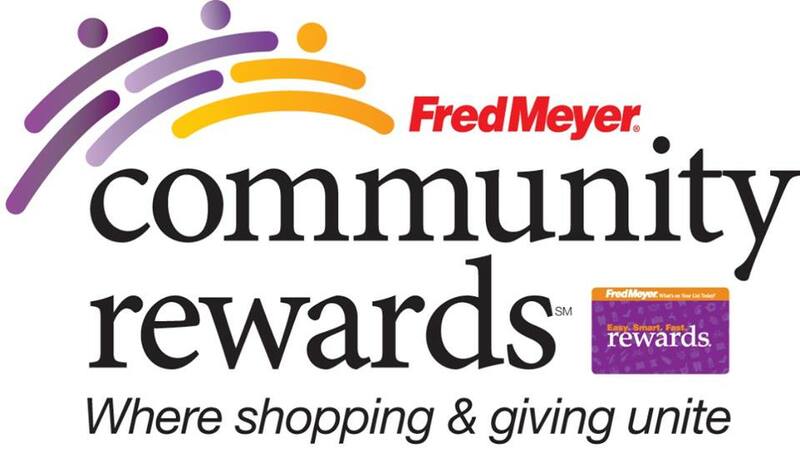 Simply go to www.fredmeyer.com/communityrewards and link your rewards card to Monroe Historical Society – you can link by name or by our non-profit number . You still earn your rewards points, fuel points, and rebates. You can also sign up at the customer service desk. Amazon will also donate a portion of sales to the society, using AmazonSmile: www.smile.amazon.com and choosing Monroe Historical Society. Every little bit helps! 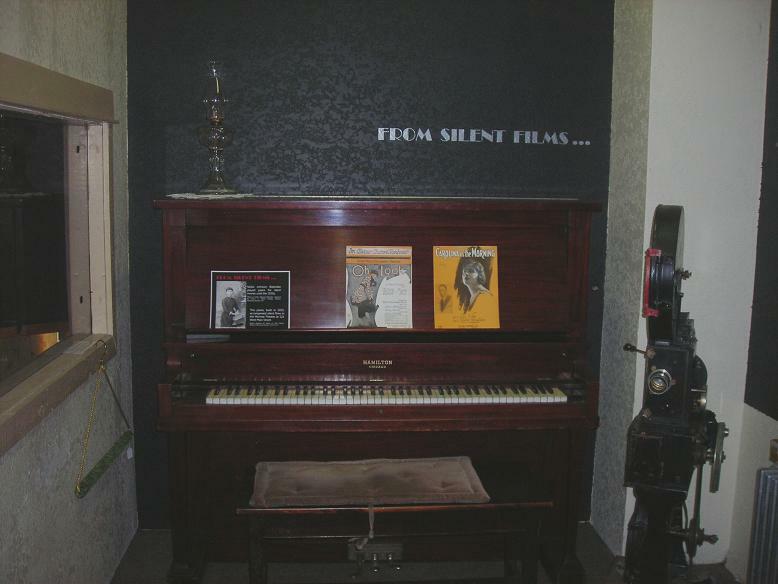 The upright Hamilton piano that once provided music at the silent movie theaters of Monroe was installed at the museum in October. Nellie Johnson Blakeslee (photo on left side of piano) played the piano at various venues in town for many years. Recently tuned, it sounds beautiful! 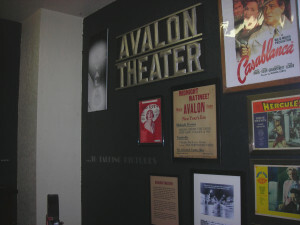 Adjacent to this new addition to the museum Chris Bee, museum director, has been working on a display for the Avalon Theater. 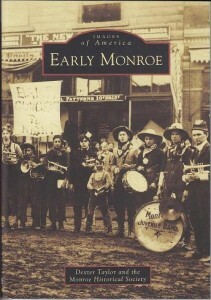 Originally the Monroe Theater, it opened in 1929 and showed the first “talkie” in town in 1930. 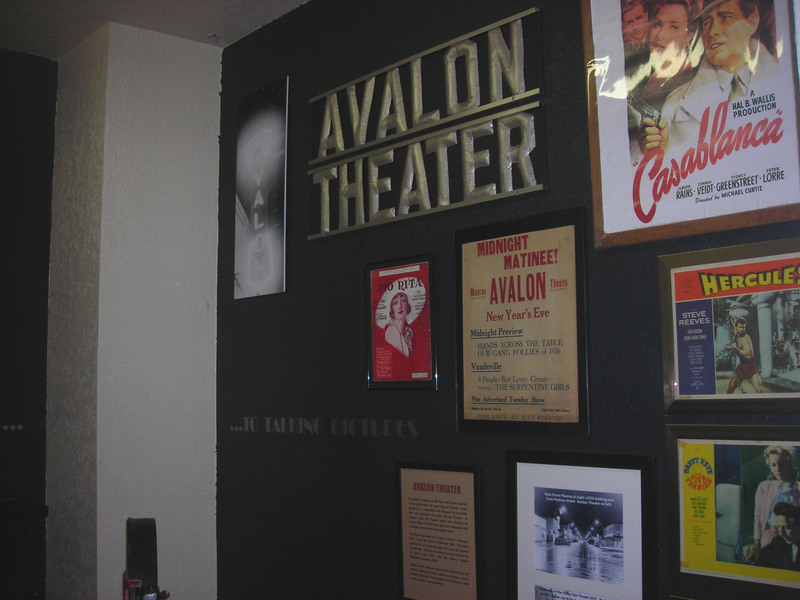 The projector next to the piano was from the Avalon. The theater ended its run in 1966 and the site is now a parking lot. Continuing along that wall visitors come to the recently completed pioneer school display. 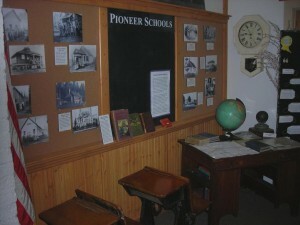 The heavy black slate on the wall is one from the old Wagner School which closed in 1956.